There were a total of 31 of us travelling to France including the coach driver, of those, 9 were making there own way for various reasons. Those of us travelling by coach departed Eastry around 16:30. The timings are always difficult, having to allow for the booking in time for the coach at the docks, the ferry crossing itself, loss of an hour due to time differences and the drive to Longpré, always a little slower by coach. So although not far 'as the crow flies' we weren't due in Longpré until a little after 22:00. The weekend started in good style, with a meal in the Brasserie onboard, (I had to undo the auto-correct spelling which converted it to brassiere! ), it is an excellent way to enjoy the crossing. 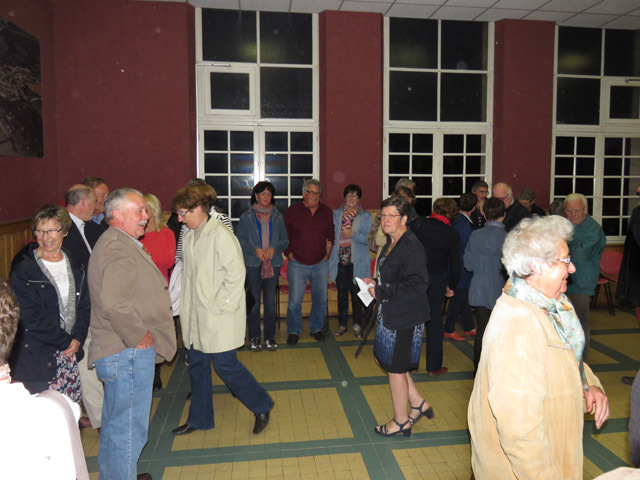 The journey to Longpré was uneventful - not always the case, and we arrived at the Mairie on time, where we were met by all the hosting families. We had first time twinners Ken and Sue and Dave who hadn't been to Longpré for many years so there were lots of introductions to be made. 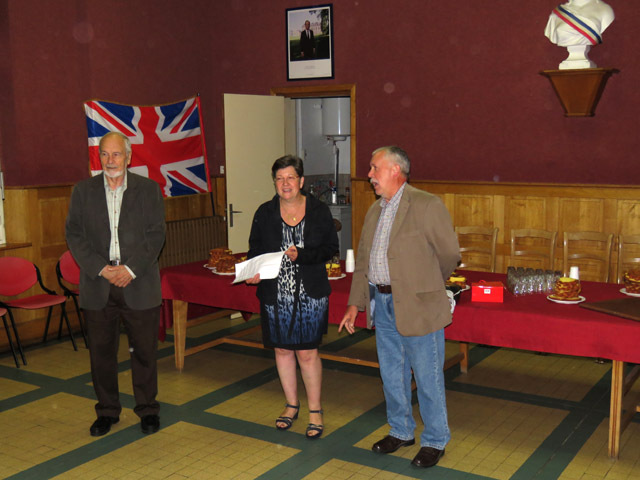 We were given drinks and slices of Gateau Battu, a traditional cake of Picardy, served at weddings and other ceremonies, these had been prepared by members of the jumelage for us. The translation is 'Beaten Cake' because the dough is beaten by hand and then cooked in a tall fluted cylindrical mould to give a light and airy brioche style cake. 125g of flour, 5 egg yolks, 85 g of sugar, 125 g butter, yeast, a pinch of salt. 1. In a bowl, combine flour, egg yolks, yeast, sugar, salt and warmed butter. 2. Knead the mixture for 20 to 25 minutes and let rest for one hour. 3 . When the dough is risen in the bowl, fold it down. Let it rest for 1 hour. 4 . Fold it again. 5 . 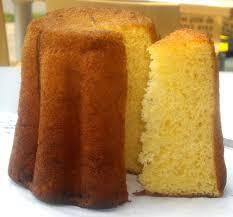 Pour into the buttered mould (about a quarter of its height to allow room to rise). 6 . Let the dough rise for 60 to 90 minutes. 7 . Bake in a hot oven at 170 ° for about 20 minutes (or until golden brown). 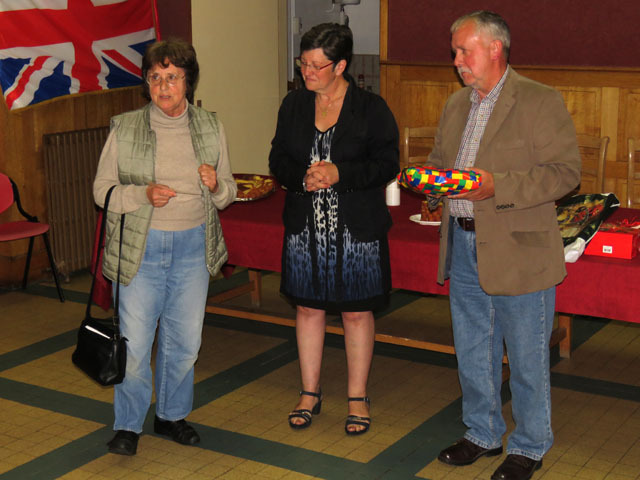 Speeches were made by Chairman Terry and Longpré jumelage President, Patricia and gifts were exchanged. Terry presented the gift from Eastry, a bowl, hand-turned by a Kentish artisan, made of cherry wood from a village churchyard. 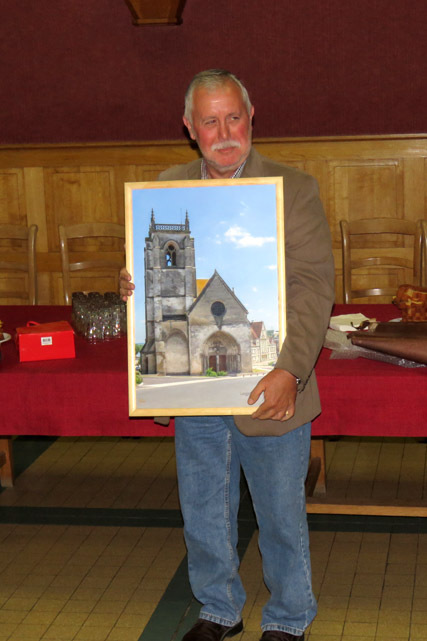 The gift from Longpré, presented by Patricia was a large framed picture of the church, Notre-Dame-de-l'Assomption, which will look good in our 'Twinning corner' of the church in Eastry. Formalities over, we went home with our hosts. One problem though was that the party of 5 who were travelling independently had failed to show up, but without any contact details we were unable to discover why. Their whereabouts wasn't discovered until some time later when contact was eventually made, unfortunately due to unforeseen circumstances they had been unable to make the journey, and were safe in Eastry. everyone was relieved it wasn't anything serious and they weren't stranded on a motorway somewhere in France. Next time we'll exchange contact details with everyone! A slightly early start was required for the events planned. We were all meeting up in the car park of The Poppy Bar, Ovillers-la-Boisselle, about an hours drive from Longpré for a tour of some of the significant cemeteries of the region. 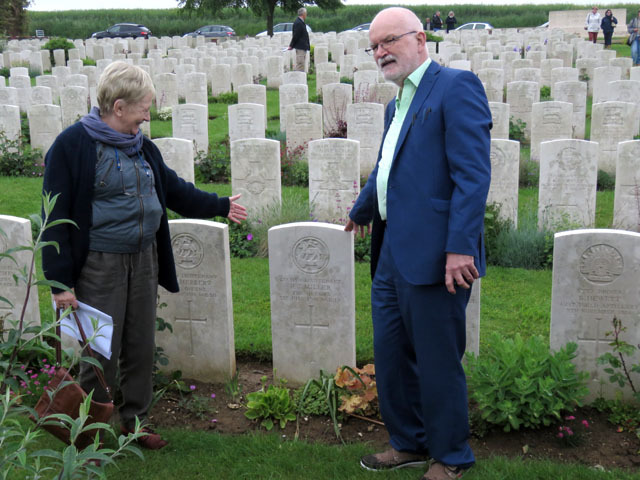 2016 marks the 100th anniversary of the Battle of the Somme and it had been a plan of the late Jean-Marc, previous President, to conduct this tour. Patricia, his widow took his plans and turned them into a very interesting event for us. 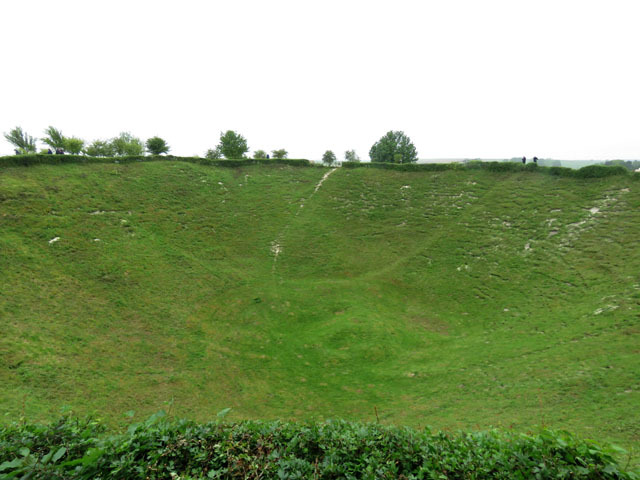 The convoy of cars took us firstly to Lochnagar (details here:- http://www.lochnagarcrater.org/ ) a massive crater created when 60,000lbs of Ammonal high explosive was detonated under German lines. Our tour guide, Jean-Michel and his wife Isobel, family friends of Patricia gave us information about the sites we visited. In the photo (left) he is explaining to the group how the crater was formed. (Right) the crater itself, 220 feet (67 metres) diameter excluding the lip, and 450 feet (137 metres) across the full extent of the lip. Right -38th (Welsh) Division Memorial, Mametz. Our travels took us to see The Pipers Memorial at Longueval, to see the memorial and description follow the link below. 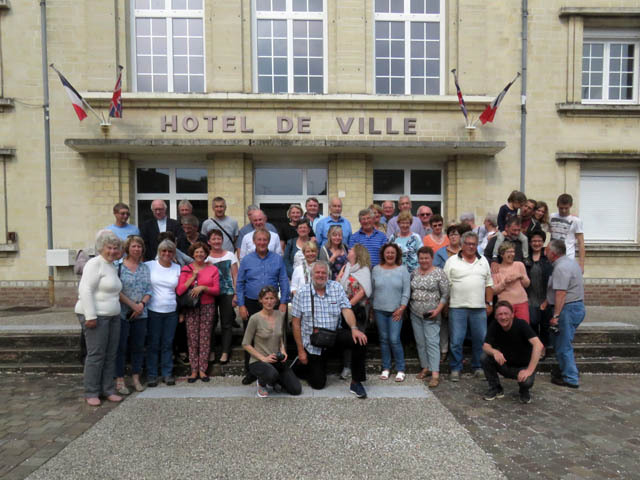 It was at Longueval that we stopped for lunch, in the Hotel de Ville, thanks to Jean-Michel and Isobel for arranging permission in their home village. Tables, chairs and baskets of food and drink appeared and although not everyone could get inside there was an overspill picnic outside, for the chosen few. We visited several other memorials and cemeteries, all of which were immaculately maintained, although a few were undergoing some work in preparation for official visits marking the centenary. 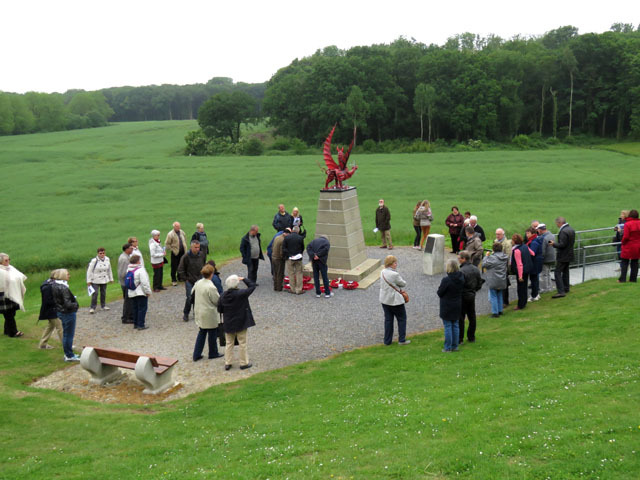 Sites visited included The New Zealand memorial of Longueval, it marks the position which the New Zealand Division gained as their original objective in the First Battle of the Somme. The Newfoundland Memorial Park, a site on the Somme battlefield near to Beaumont Hamel, with its preserved trench lines and famous Caribou memorial statue. 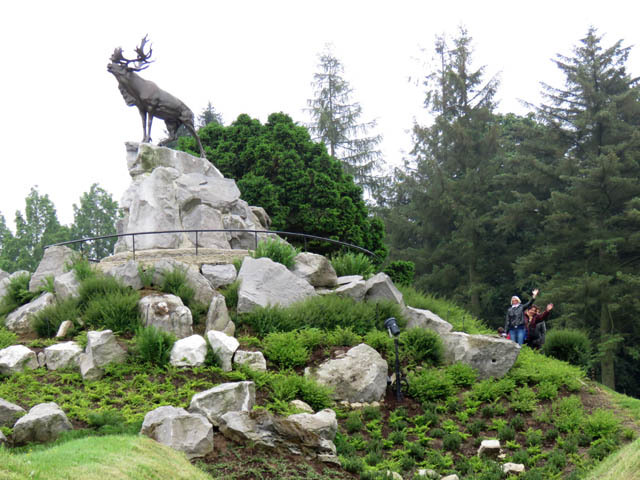 Left:- The Caribou monument at Beaumont Hamel. 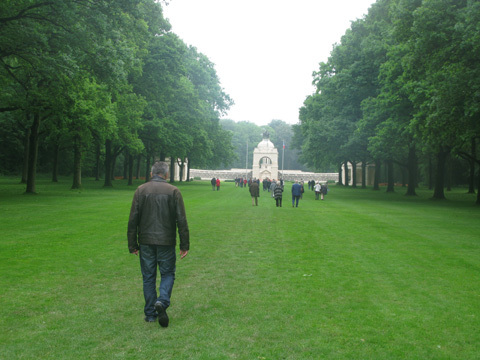 The memorial at Delville Wood is a national memorial dedicated to all South Africans who served in all theatres of war. Group photo at the First Australian Division Memorial, Pozières. Stops at Thiepval and the Pozières British Cemetery, Ovillers-La Boiselle concluded our very informative and poignant tour. 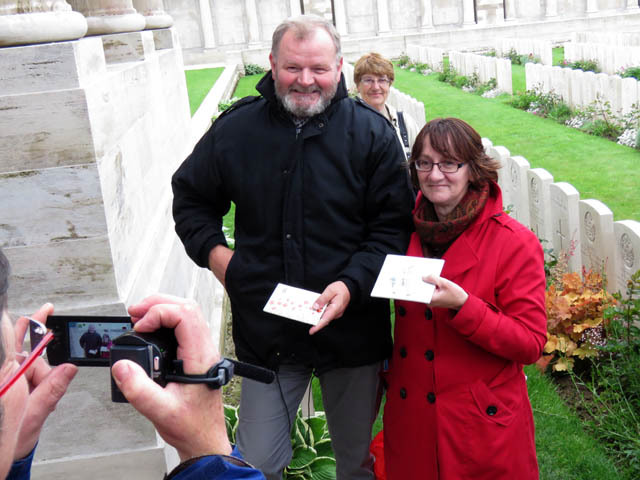 Poignant for obvious reasons but made even more so by the fact that Bill found the headstone of a relative and Cheryl found a Great Uncle on the memorial at Thiepval. The Thiepval Memorial to the Missing of the Somme is a war memorial to 72,246 missing British Empire servicemen who died in the Battles of the Somme of the First World War between 1915 and 1918, with no known grave. our tour guides for the day. A quick change of clothes and it was out again for our evening meal at a little Turkish eatery in the neighbouring village of Condé Folie. Large quantities of grilled food and spicy cous-cous followed by a choclate desert set everyone up nicely for a well earned sleep! 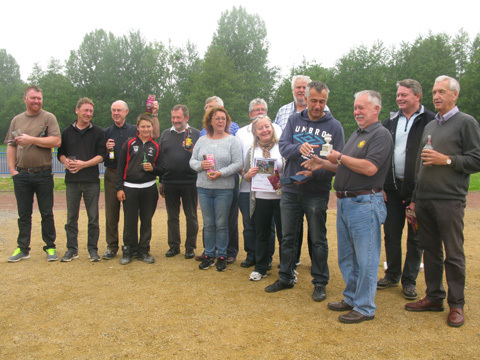 For a few of the Twinners, me included, Sunday morning is the time for the annual petanque match, for the coveted prize of the Ashes. Many others of the group did other things on Sunday morning but they will have their own tales to tell. Terry, Robert, Graham, Teresa, Ray, Dave and myself were trying to retain the Ashes but the team from Longpré had other ideas. I will have to check to find the final score, all I do know is that we didn't manage to keep the trophy, it returned, for a year at least, to Longpré. We will have to try harder to win it back, on home soil in 2017. If you can't see the cochonette from there what chance did we have? Terry and Teresa study the situation closely. 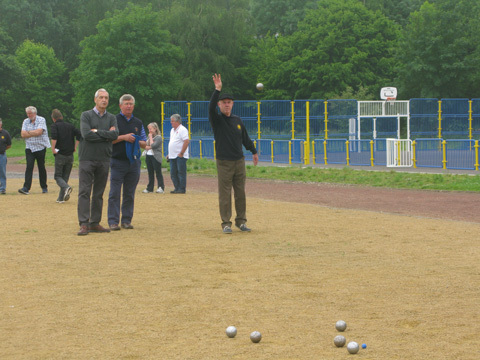 Robert in mid throw, Ray and Graham look on. It lseems like a close game. L to R. Bruno?, Eric, Robert, ?, JeanMarie, Valerie, Graham (behind), Teresa, Dave (behind), Nick, Pascal receiving the Ashes, Terry presenting the Ashes, Arnaud, Ray. In addition to above, Vincent, far left. 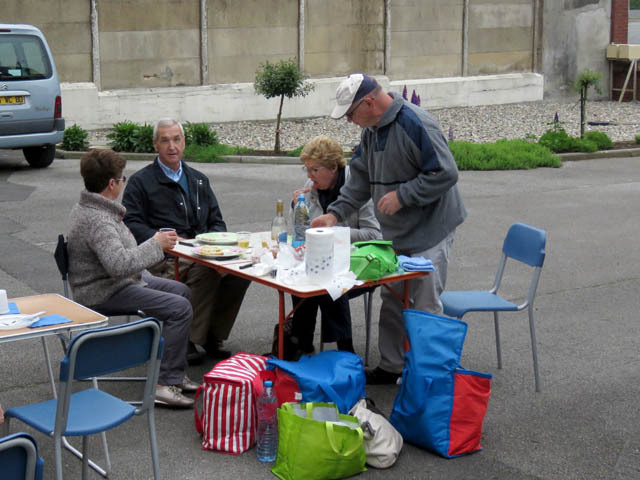 After the petanque, gift exchange and photographs, we all went back with our hosts for lunch. Myself, Lesley and Dave rejoined Patricia and we had all been invited to have lunch with Martine, Vincent, Lucas and Candice who live 2 minutes away from Patricia. After the main course we were joined by Terry, Louis Jacques and his wife. It was a lovely meal, lovely company and despite the loss at petanque, a lovely day. 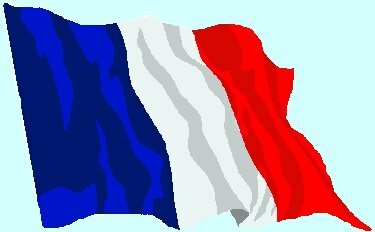 Nous étions 31 personnes, y compris le chauffeur, qui allaient en France. Entre nous il y en avait 9 qui ne prenaient pas l’autocar mais qui voyageaient à leur guise pour des raisons variées. Ceuc qui ont pris l’autocar ont quitté Eastry vers 16.30. L’horaire est toujours compliqué: il faut tenir compte du temps dont le chauffeur a besoin au port pour les formalités, du temps que prend la croisée, de l’heure que nous perdons à cause de la différence entre nous et la France, et du temps que prend le voyage à Longpré, voyage un peu plus lent en autocar. Donc, quoique la distance ne soit pas tellement longue en elle-même, nous avons dû partir de bonne heure pour y arriver vers 22.00. « Brasserie » en « brassière »[soutien-gorge]!) Dîner ainsi rend la croisée énormément agréable. Le voyage à Longpré s’est fait sans incident–ce qui n’est pas toujours le cas–et nous sommes arrivés à la Mairie à l’heure. Là on a fait la connaissance de toutes les familles qui allaient nous recevoir. Puisqu’il y avait parmi nous quelques « débutants », Ken et Sue, et aussi Dave qui n’était pas allé à Longpré depuis long temps, il y avait beaucoup de présentations à faire. On nous a offert des boissons et des tranches de « Gâteau Battu »–gâteau traditionnel qu’on sert aux noces et à d’autres fêtes dans la région de Picardie. Les membres de l’amicale les avaient cuits ou achetés pour nous. « Gâteau Battu » se traduit « Cake Beaten by Hand » parce qu’on le bat à la main et le fait cuire dans un grans moule à Charlotte. Il en sort un gâteau très léger et délicat, style « Brioche ». 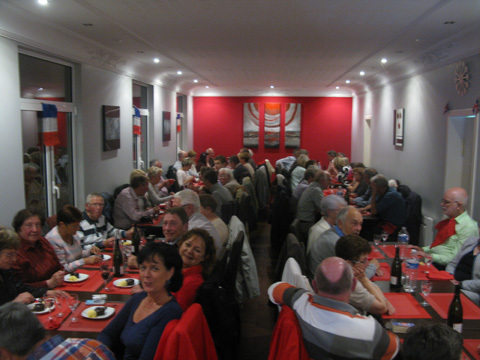 1/ dans un saladier, mélangez la farine, les jaunes d'oeufs, la levure, le sucre, le sel et le beurre tiédi. 2/ pétrissez le tout entre 20 et 25 minutes et laissez reposer une heure. 3/ quand la pâte est montée dans le moule, rabattez-la. Laissez-la à nouveau reposer 1 heure. 5/ Versez -la dans les moules beurrés au quart de leur hauteur. 6/ Laissez monter la pâte. Comptez entre 1h et 1h30. 7/ Mettez à cuire à four chaud à 170°, environ 20 minutes. Les Présidents, Terry et Patricia, ont fait un discours et échangé de cadeaux. Terry a présenté le cadeau d’Eastry: un bol, tourné à la main par un artisan du Kent; le bois en venait d’un cerisier qui avait poussé dans un cimetière de village tout près d’Eastry. 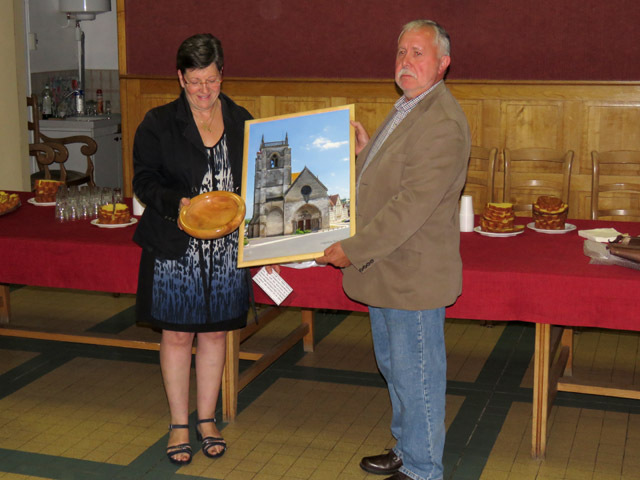 Le cadeau de Longpré, présenté par Patricia, fut une grand image encadrée de l’églisse Notre-Dame-de-l’Assomption. 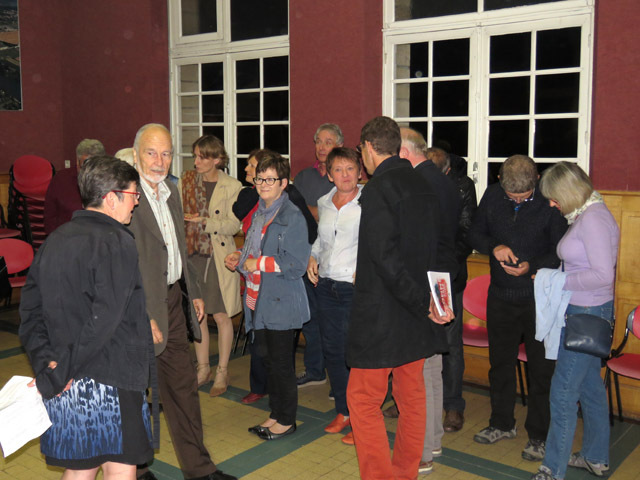 Elle va figurer dans le « Coin de l’Amicale » dans l’église d’Eastry. Les formalités ainsi complétées, nous sommes rentrés avec nos hôtes. Il restaiat quand-même un problème. Un groupe de 5 personnes qui voyageaient indépendamment n’était pas arrivé. Mais, n’ayant aucun moyen de les contacter, on ne savait que penser. On n’a pas découveret le lieu où ils se trouvaient que plusieurs heures plus tard lorsqu’on avait enfin réussi à les contacter. Malheureusement, à cause de circonstances imprévues, ils s’étaient trouvés incapables de faire le voyage et étaient en effet sains et saufs à Eastry. Tout le monde fut soulagé en apprenant que rien de grave n’était arrivé et qu’ils n’étaient pas perdus quelque part en France dans le réseau de l’autoroute. La prochaine fois on échangera de détails entre nous afin de pouvoir faire contact au besoin. Il a fallu se lever assez tôt à cause des évènements à venirr. 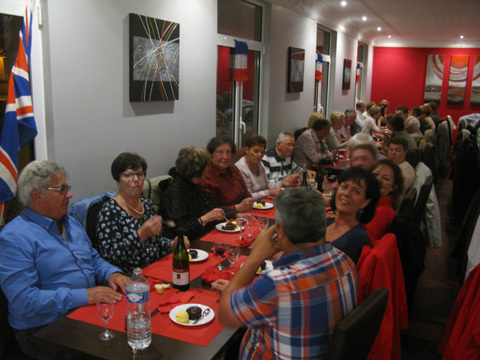 Nous allions nous rassembler dans le grand parking du « Poppy Bar », Ouillers-la-Boisselle, une promenade d’une heure en auto. Il y aurait un tour de quelques-uns des cimetières signifiants de la région. L’année 2016 c’est le centième anniversaire de la Bataille de la Somme et Jean-Marc, le dernier président, avait eu l’idée d’organiser ce tour. Sa veuve, Patricia, a réalisé ses plans et en a créé une excursion pleine d’intérêt pour nous. Le convoi d’autos nous a apportés d’abord à Lochnagar (à voir :http://www.lochnagarcrater.org/) un cratère énorme qui fut créé lorsqu’on a fait détoner 60,000 livres d’explosifs Ammonal au-dessous des lignes allemandes. Parmi les sites qu’on a vus, il faut compter: le mémorial de la Nouvelle-Zélande, qui marque la position que la division nouvelle-zélandaise avait choisie et obtenue pendant la première bataille; le parc mémorial de la Terre-Neuve, près de Beaumont Hamel, qui a préservé des chicanes et qui contient la statue célèbre du caribou. 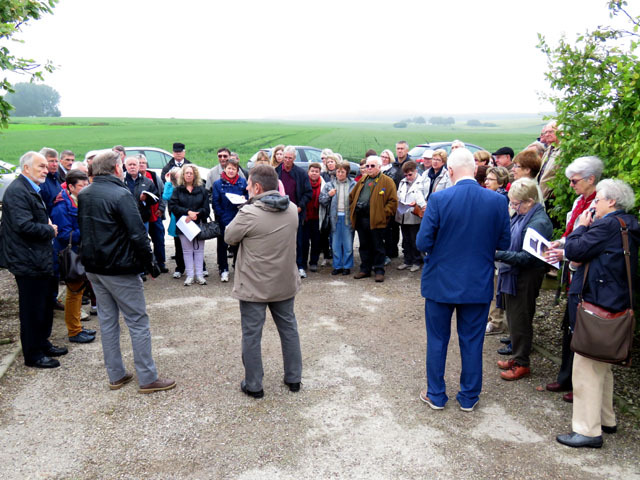 On s’est arrêté aussi à Thiepval et au cimetière britannique de Pozières; Ouillers-La-Boiselle fut le dernier arrêt de ce tour informatif et poignant–touchant pour toutes les raisons qu’on connaît bien mais doublement touchant pour notre groupe parce que Bill a trouvé le tombeau d’un parent et Cheryl a déniché à Thiepval le nom d’un grand-oncle perdu. Notre guide, Jean-Michel, et sa femme, Isobel–des amis de Patricia. Ils nous ont donné des informations au sujet des sites. Dans la photo à gauche Jean-Miche explique la formation du cratère. À droite, le cratère lui-même: 200’ (67 mètres) de diamètre, à l’exclusion du bord, 450’ (137 mètres), y mètres, y compris le bord. 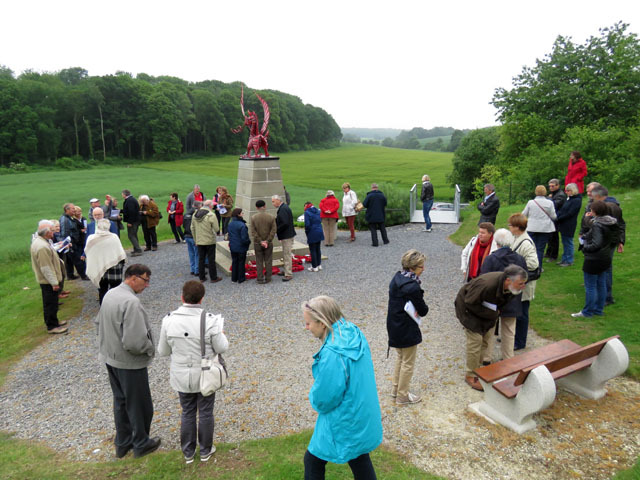 À droite, le mémorial au 38ième Division galloise, Mametz. 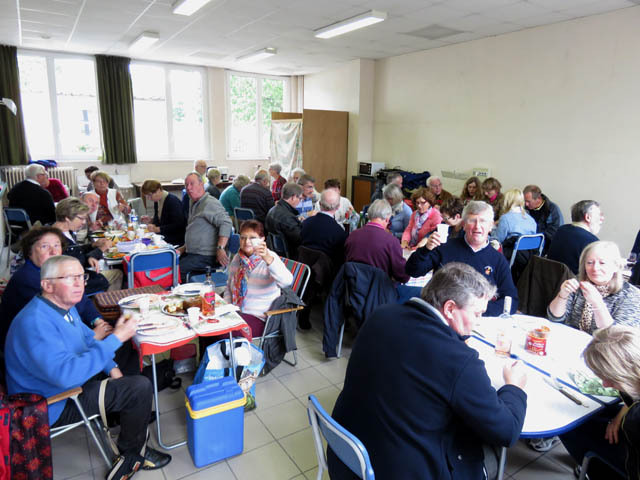 Ce fut à Longueval en effet qu’on s’est arrêté pour le lunch, à l’Hôtel de Ville, grâce à Jean-Michel et à Isobel qui ont demandé la permission du village où ils habitent. Tables, chaises, paniers remplis de boissons et de nourriture, tout a apparu et, quoiqu’on ne pouvait pas accommoder tout le monde à l’intérieur, il y avait un hors aire de pique-nique pour les élus. Nous avons visité plusieurs autres monuments et cimetières. Tous étaient immaculés quoiqu’on était en train d’en améliorer quelques-uns en vue des visites officielles au cours du centenaire. À gauche, le monument au caribou, Beaumont Hamel. À droite, le mémoirial sud-africain, Delville Wood. Le Mémorial à Delville est national et commémore tous les sud-africains qui ont servi dans toutes les batailles. Ce dernier rappelle 72,246 militaires de la Grande-Bretagne et de l’Empire, morts sans aucun tombeau pendant les batailles de la Somme au cours de la premièreguerre mondiale, entre 1915 et 1918. The Queen’s, le1ier juillet, 1916. On remercie Jean-Michel et Isobel, nos guides pendant tout le tour et on se dit au revoir. Après avoir mis rapidement des vêtements de rechange, nous sommes repartis pour un petit restaurant turque dans un village tout près, Condé Folie. Le repas du soir consistait en une abondance de viandes grillées, du couscous aromatique et un dessert au chocolat, ce qui a bien préparé tout le monde à jouir d’un sommeil profond et bien mérité. 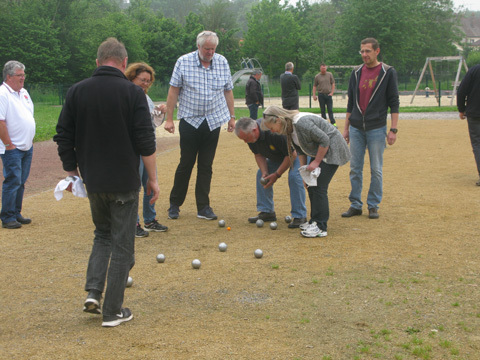 Pour quelques-uns des membres de l’amicale, y compris moi-même, le dimanche matin c’est le match de pétanque annuel. 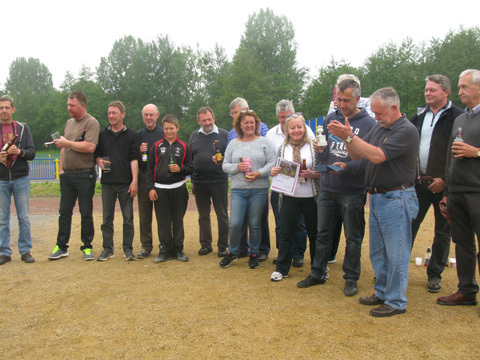 Le prix auquel on aspire c’est « The Ashes » (Les Cendres). D’autres auront fait quelque chose de différent, mais eux ils racontent leur propre histoire. Terry, Robert, Graham, Ray, Dave et moi, nous esayions de retenir « Les Cendres » mais l’équipe de Longpré avait d’autres idées. J’aurais dû vérifier le résultat; je ne sais que nous n’avons pas réussi à retenir la coupe et qu’elle est retournée, pour une année au moins, à Longpré. Nous devrons faire de plus grands efforts dans la terre de nos ancêtres afin de la réclamer. Si vous n’arrivez pas à bien svoir le cochonnet, comment y arriverions-nous, vue l’endroit où vous vous trouvez? Terry et Teresa étudient la situation très sérieusement. Robert en train de lancer. Ray et Graham en train de regarder. On dirait que les deux équipes jouent serré. Après le match et les échanges de cadeaux et de photos, nous sommes retournés tous chez nos hôtes pour le déjeuner. Moi, Lesley et Dave, nous avons rejoint Patricia puisqu’elle nous avait invités avec Martine, Vincent, Lucas et Candice, qui habitent tout près. Quand on avait fini le plat principal, Terry, Louis-Jacques et sa femme sont arrivés. Le repas et la compagnie étaient formidables, et–malgré le match perdu–la journée également.